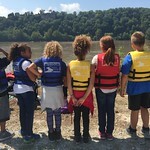 4th grade Columbia Public School teachers will have the opportunity to bring their students to the Missouri River for a one of kind learning experience. Every student dreams of being on an All-Star team. In this after-school program, 100 Columbia Public School 4th graders and 8 teachers will have the opportunity to learn about the Missouri River ecosystem and the impact that humans have on the river. Students get a unique opportunity to make new friends while developing a hands-on relationship with the Missouri River. At Katfish Katy's in Huntsdale, Missouri. We had a fun and successful auction. 145 people attended - more than 100 more than our last auction! Auctioneer John Harrison from the Callaway Livestock Auction led the bidding, and he rocked it! All but two pieces met their minimum bid and most received as much or more than their retail value. That feels good for everyone. We had fantastic food donated by Tellers, Addison's, Coley's, HyVee and several of our dear friends. 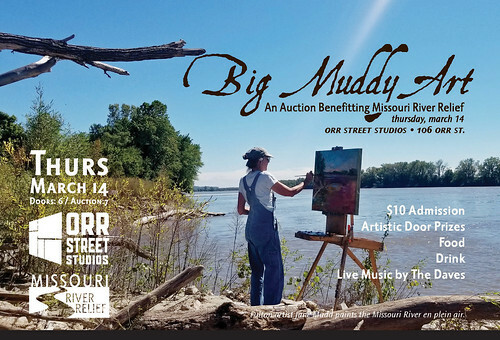 Thanks to the generous donations of our artist friends, we raised $8,000 for Missouri River Relief programs. Thank you to Orr Street Studios for donating the space, and for all the volunteers and art lovers that made it possible! The new 2019 schedule is here! Check out what all we have in store for this upcoming year. As we get closer to the dates you will find links to full web pages detailing our events here. Also, make sure to check out our new online calendar here. Nearly one third of our funding come from individuals like you, please consider making an online donation today. 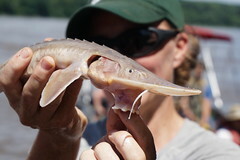 The Missouri River is home to fascinating creatures, as well as many issues. In these packets, a broad range of information is introduced and discussed; from the giants who dwell in the depths, to the consequences of the interaction between cities and the Missouri River. 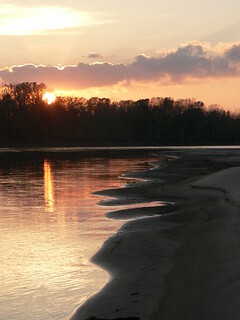 There are many ways that you or your organization can support the great work we do along the Missouri River. In addition to becoming a sponsor, giving through your workplace, or lending your volunteer muscle, Missouri River Relief kindly accepts in-kind donations of food and river clean-up supplies such as tools, gadgets and gear. Make sure to check out our full equipment wish list here. Enjoy the Big Muddy Speaker Series each month in three cities! The monthly series is held in three locations, Rocheport , Kansas City and St. Charles. The free presentations bring in experts to discuss Missouri River issues, biology, hydrology, history and more.